Last year, 2013, was very exciting for 5 public libraries in Idaho who had the privilege to be included in ICFL’s pilot project “Make It”. Make It has given our libraries the resources, training and motivation to bring makerspaces, and more importantly the maker culture, into our communities. Now this is not the forum to extoll the awesomeness of the Make It program or to bring to light the coolness of the various projects being worked on, but this is the perfect place to share with everyone some of the experiences we’re having with our newest piece of technology. Meet our 3D printer. 3D printing has been around for quite awhile, but has only become mainstream in the last few years. 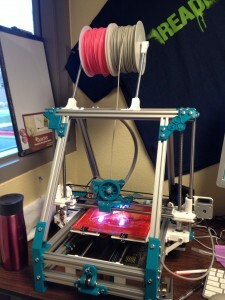 Our printer was made from members of Open Lab Idaho and is an open source RepRap MendelMax. The focus of the Make It project has been on teen and tween programming; however, as we get more accustomed to using the printer we plan making it more open to the public . We are recently ran a contest for 3D design for our library patrons ages 5 and up. The contest was broken into 3 age groups and mimicked a similar program hosted by the Westport Library. We provided prizes for each age group that included printing their designs, library bags, flash drives and $25 gift cards. We set up demonstrations at each of our locations to inspire interest in 3D printing and 3D design which lead to a greater interest in participating in our contest. Our contest had a good number of kid and teen participants but unfortunately no adults participated. We did have 3 entrants in our staff contest that was running concurrently which was a fun way to incorporate staff into Make It. Our 3D printer creates each print by laying down layers of plastic as configured by the computer to match the 3D design. We have control over a number of settings that will alter how the printer operates and how the print will look when finished. Typically we don’t have to change settings between prints but we have the ability to quickly add in support for overhanging prints, change the amount plastic to create the model’s infill or to change the print patterns. Using MendelMax we have the ability to adapt, upgrade or modify our printer without having to buy the newest model. One of the changes I’ve made so far was to simply print a new method of holding the filament spools so that I could quickly change the plastic. The change was pretty simple but it reinforced the idea that our printer can be a dynamic tool easily altered to better fit our needs and our situation. Knowing those changes are only a few mouse clicks and a 30 minute print away has created a great way for us to further “sell” the 3D printer during our public demonstrations. Our 3D printers use 3mm PLA or ABS plastic. We have only used PLA plastic as it is corn based plastic that is biodegradable. Although the settings can be altered, we typically print the plastic at 185⁰C with the glass platform heated to 60⁰C. Each layer using our default settings will print .25mm layers using a rectilinear pattern for top and bottom layers with a 15% infill using a honeycomb pattern. We use 3 layers for both the top and bottom of each print to help give each print a stronger finish. If you’re interested in seeing all of the print settings you can view the screenshots of our default settings in Slic3r here. So why 3D printers? There are several reasons to have them in libraries, for us it is a natural progression to provide access to new technology. Our 3D printer has become the focal point of our maker programs, something to grab someone’s attention long enough to start a discussion about libraries and library programming. We have had a number of people stop by the library for the first time just to see the 3D printer only to find out that our library offers much more than shelves of books. For years libraries have provided public computers for our users to access the internet, type papers and learn computer skills. As new technology evolves faster than most of us can keep up with, it is important for libraries to help provide access to information for our users to succeed in the ever changing technological landscape. 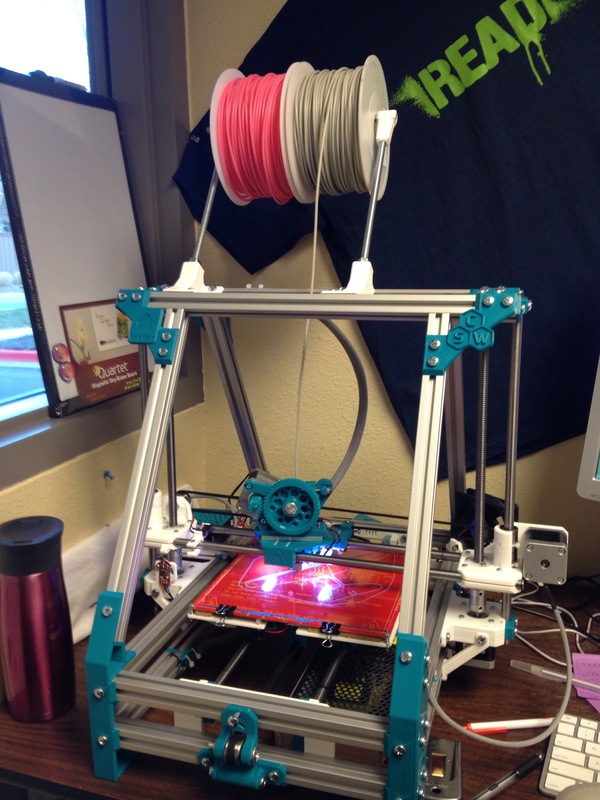 Not all libraries will be able to put a 3D printer into their libraries but there are no cost ways to include 3D Design into library programs, entry level options including a 3Doodler, and ways to send your designs off to be printed for a cost. 21st Century skills are elusive and ever changing although we can help make our library users digitally literate by increasing their digital fluency. The best way to do this is to encourage digital education through exploration. As education shifts priority for students to STEM we would like to help further shift that to STEAM. I love to play with new technology and find ways to include it in what our library offers. As part of the Make It program some of our librarians have created Make It Take It kits that circulate. We received a grant from YALSA/Best Buy to purchase new tech including a Leap Motion Controller (lots of fun!) and MIDI keyboards for music creation. This weekend I’m going to work on creating a 3D scanner using an Xbox Kinect and an Arduino. Our plans can be ambitious and they don’t always work out, like our failed prints, we learn from them. Next on our plate is to expand Make It programs to other age groups, including adults. I’m excited about the future of our 3D printer, Make It and the role libraries can play in supporting the changing information needs of our communities. Nick works at the Meridian Library District as a Digital Librarian. In addition to SPLAT he has participated in the Idaho Make It project to bring makerspaces to public libraries in Idaho. His interests are playing with new consumer technology and sharing that with others. Nick recently worked on opening unBound which is the digital technology library for the Meridian Library District where he gets to share his affinity for technology with people of all ages. Is Windows 10 right for libraries?